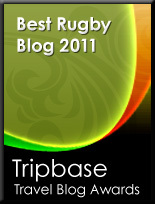 TOTAL FLANKER...a rugby blog: Priorities? Good to see that The Artist Formerly Known As Gavin Church has his priorities sorted. It appears that our orange friend will be returning to our TV screens shortly to find "the woman of his dreams" in the UK version of The Bachelor on Channel 5. "I've always been dedicated to my rugby and continue to train hard but as the season draws to an end I can focus on meeting the right girl," says the former ballroom dancer, clearly entirely oblivious to how ridiculous this sounds. Given his track record, the fact that our favourite tangerine-skinned celebrity cannot appreciate the incongruity of focusing on "meeting the right girl" at a time when his focus might better be applied elsewhere should come as no great surprise. The fact, however, that all this appears to be happening with the apparent blessing of the Welsh management is, perhaps, less understandable and another indication that Warren Gatland may just have mislaid the plot. He is the Welsh version of Dan Carter, but this takes it to a whole new level. No one would mind if he was as good as Dan Carter at rugby, but he isn't! Apparently he was already tied into the contract before the squad announcements though and so the management couldn't do a lot about it. As long as he knuckles down in training at the same time it shouldn't be an issue. The management couldn't do a lot about it? Apart from not select him, obviously!! He just can't quite get it right. Look Gavin, you're either an international standard rugby player or you're a TV celebrity; you can't be both. To be frank Tinlegs he actually doesn't seem to be able to step up to the mark in either field of 'expertise' - what a first class 24 carat plonker!!! Sorry, what was the question?